Counting the Cost. – Love Restores. I was in a meeting the other day listening to a presentation about some of the ways we’re moving forward at Tearfund. One guy asked a colleague of mine, “so, what’s the dream then? What does this look like in practice?” and her answer kind of stuck with me. We often talk about abstract ideas and big concepts, knowing that this issue of poverty is both widespread and incredibly deep, but in that moment she made it real, concrete and very personal. I knew my part. There is of course a lot at play here, and unless I took myself to live in a field somewhere and grew all of my own food, produced my own electricity and didn’t have a car (or fly around the world!) there’s a limit to my ability to make that statement true on my own. But I shouldn’t let that fool me into thinking that there isn’t a great deal that I can do about it, if only I would choose to. As I sat and reflected on her words I started to realise how much it would cost me to change my lifestyle in that way. Sometimes I’ve been guilty of glamorising the simple life; painting a picture in my head of the perfect little garden full of fresh fruit and veg, a wardrobe full of uniquely up-cycled outfits and cycling around on my bicycle without a care in the world. It seemed easy and like a fun alternative way to live. But the reality is somewhat different for me. I’m not very good at looking after my garden because I don’t get round to watering it- I’ve killed more tomatoes than I’ve grown. I really like my sleep and if I chose to walk to work rather than drive I’d have to wake up an hour earlier and that’s a massive deal for me (!) I haven’t yet managed to go to the local farmer’s market on a Saturday morning to pick up groceries because it’s so much easier to drop by the big supermarket chain on my way home, and I get a little too click happy when I’m browsing on-line and decide that I really do deserve another dress, book or item for the house. I enjoy luxuries and the very comfortable and convenient life that is building up around me and if I’m serious about not wanting my life to harm others then there are some things I’m going to have to say no to that I’ve simply got too used to. The green movement has become trendy, and in many ways that’s great. I love that social justice is moving up the agenda and people are taking it seriously, but lets not be naive about the fact that it’s going to cost us something. It has to. If we’re looking for short-cuts to ethical lifestyles then we’ve got it wrong. The point is that for years and years other people have been sacrificing so that we can live the lives we do…and perhaps now its our turn. I love that in Luke, when Jesus is talking about following him and picking up our crosses he tells us to “count the cost” because it’s not going to be easy. Most of the time when I’ve thought that over I’ve put it in terms of persecution and suffering, but perhaps there’s something more. Perhaps it’s going to cost us to Live Differently in the world and it’s time we count that cost. My mate asked me yesterday if I could picture Jesus buying a T-shirt that was made in a sweatshop or supporting a system or corporation that was oppressing people. Of course the answer was no. So something in my life has to change if he’s who I’m following. I write this not to condemn or spread guilt, because that’s helpful for nothing, but more to share what I’m wrestling with in the hope that you might challenge me more and keep me to account. 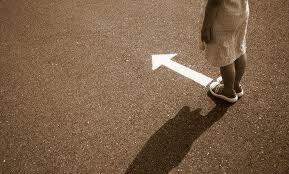 As with any journey I think its about figuring out the direction you want to walk in and then taking one step at a time. Next Post Dream bigger little girl.